28 October 2002, new 8 applications got IFC R2.0 certification in Tokyo. In the picture: Kajima (5), Sumitomo Cement System, Fujitsu, BLIS (2), NEC from right hand side. 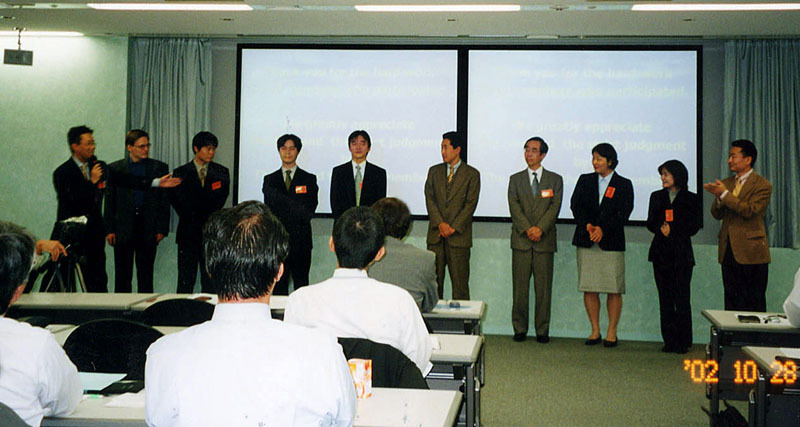 In October 2002, just before autumn in Tokyo, Japanese AEC companies have been organizing weekly workshops to prepare for the coming IFC certification in the end of October 27th to 28th. The picture taken on 17th October, shows their enthusiasm. Kajima (4 applications), Fujitsu (1), Sumitomo Cement System (2) and NEC (1) try to get the certification this time. There were two IFC related seminars. First, IAI Japan Chapter had three hours seminar session and they presented latest news about IFC implementations and pilot projects including a lot of BLIS projects. Second one is an introduction of Kajima's in house DB-CAD system that utilizes IFC technology. At this moment, 5 software vendors are going to join the certification.